Portadown players will spend the opening day of the Danske Bank Premiership training together as manager Pat McGibbon attempts to maintain team unity in the face of this week’s disappointment. A suspension imposed on the club by the Irish Football Association for “non-payment of fines” has cast a shadow over the final week of preparations for McGibbon’s first full season as Ports boss. Three days of drama featured Tuesday’s confirmation of the suspension, followed by an emergency meeting of the IFA disciplinary committee that voted to uphold the ban before an appeal lodged Thursday by Portadown forced a temporary reprieve of the punishment. The Ports will stand before the IFA appeals board at some point on the week starting August 15 but, with that decision pending, Northern Ireland Football League officials last night (Thursday) decided to postpone the scheduled visit by the club to Coleraine this weekend for the first match of the domestic season. McGibbon has had his summer dominated by off-the-field affairs but the former Northern Ireland international remains impressed by the focus from within the dressing room. “We had a training session tonight and, to be honest, I was delighted with the positive mood around the squad,” said McGibbon on Thursday night. “It is obviously frustrating for managers, players, supporters and everyone connected to both Portadown and Coleraine. “We all look forward to that first game of the season but now we must turn our attention to Wednesday and the match with Ballinamallard United at Shamrock Park. 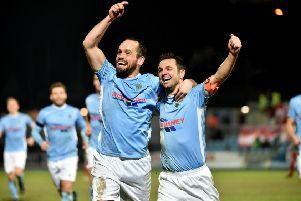 “I was at the NIFL launch on Wednesday with our club captain, Keith O’Hara, then heard the news of the IFA disciplinary hearing on the way home. “It was a bad way to finish such a positive evening but our job now is to prepare for Wednesday. “With that the case, I was very keen to get a look at the squad tonight and see how they reacted to the situation. “We have had such an encouraging pre-season so it was brilliant, from a management viewpoint, to see the players just get on with the business of working hard.